Want a Free Copy of WP Pusher? Comments are closed as the winners have been selected and emails. Thanks to all who participated! One of the more popular services that has to come to WordPress within the last year or so is the ability to integrate Git into your theme, plugin, and/or application development workflow. Services like GitHub and Bitbucket are responsible for the rise of Git, has introduced many people to source control (who I wonder if they’d ever use it), and then third-party services have made it possible for other people to connect their repository to another environment and deploy the changes. It completely cuts out the middle-man of S/FTP and makes sure that we’re able to deploy true changesets of our work so that the code that’s sitting in our staging (or even production) areas are as updated as possible. Sure, there are a number of services out there that do this type of thing; however, I’m glad that we have a plethora of choices from which to choose when it comes to things like this. But what about those of you who are just getting familiar with source control, GitHub or Bitbucket, deployments, and all of that stuff? What does all of the above stuff even mean? Simply put, it means that each time you commit something to your repository from your local computer, you’ll be able to login to your WordPress dashboard and then perform a deployment of the update with the click of a button. And the pricing is reasonable enough based on your needs. In fact, it ranges from free to $199/year. Interested? All you have to do is comment below and say so. Don’t mention which type of license you’d like as I’ll leave that up to the randomness of choosing the winners. From there, in a week, I’ll pick the winner at random and then contact you via email and put you in touch with Peter. Please remember to leave your email address in the comments so that I can contact you once the contest is over. Alright – have fun, good luck, and all that fun stuff :). I’m interested! Looks like an awesome project and wouldn’t mind getting a license to try out all it’s good features and put it to use. Nice! Sign me up. I took a look at WP Pusher a few weeks ago; they’ve really polished their pitch. Seems like a great idea and an easy way to hook up separate repos for themes and plugins. The only problem I see is a sales model based on site licenses for a GPL plugin that makes it easier to push plugins to many sites from a single repository. Saying that I’m interested is an understatement. Nice job Tom and Peter. Great work Peter looks count me in. Definitely interested! I’d love to be able to integrate some GitHub plugins and potentially themes more easily! Definitely interested. Just getting into version control so this would be a big help. thanks for the post – I hadn’t heard about this one but it’s something I’ve been hoping that someone would do well for a while now – this could be it! Seems like a pretty useful plugin, so definitely interested! Interested in this changing my mindset, as I tend to want to ignore git pushes. I would love to be considered. I’m new to GIT, and anything to ease my deployment methods would be much appreciated! I’m using bitbucket (private repos), so I haven’t been able to try this plugin out yet. So much to get my head around these days and at my age I am struggling. However this looks like something I need to look into. Guess I have the upcoming weekend to look into this. At least it will keep me out of trouble. Looks great, I will need to try this for sure. I would enjoy checking out a freelancer license if available! Thank you. I would like to get a free license of WP Pusher to play with! I’m definitely interested in this. Played around with an early release and liked what I saw. I’m definitely interested, tried something similar a way back with FTPloy but found it didn’t work quite as I liked. Would be interesting to see if this is any better. I already push my custom themes and plugins to Github. I’ve tried other ways to do this and it just never seems to come together. It would be a real time saver. Thanks for the giveaway! Great giveaway, hope to win a license! I’d love to get behind this. Been wanting to give this service a try for a while – this would sure jumpstart it! It’s pretty clear that the plugin enables updates from git hosts, but not whether it provides a way to install a plugin from a repo URL. Have you played with it enough to know? 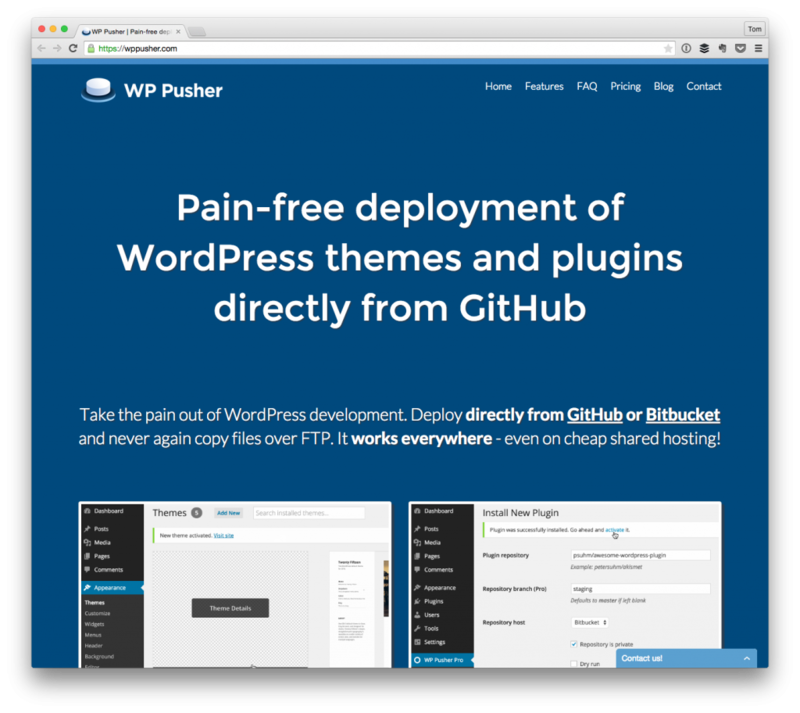 If the repository is on GitHub, Bitbucket or GitLab (.com or self-hosted), WP Pusher can install and update it. If you take a look at the GIFs on https://wppusher.com, you can see how a plugin or theme is installed. I would love to add this to my workflow and toolset. I am very interested. Its a perfect couple. WordPress & Git. I definitely want one.